"Your friends arrive at your table at the same time as the oysters, lucky for them as the taproom is almost entirely full – groups by the door are sharing flights and ordering takeaway bottles. Eccentric and genuine servers buzz around the comfortable, airy taproom that opens on to a patio – nearly full as well – and a splendid view of acres of sun-dappled grape vines." At this point, and at this hour, you could be anywhere in rural Ontario. Closed storefronts and signs for deer crossings line the road as you head into the heart of Canada’s newest wine county. A sense of the water, not far away on either side, impresses on you the idea that there is only one road, one way to go – certainly here, perhaps anywhere – the road lovingly known as ON-62, heading south. This late on a Friday night you might well have missed the elegant rows of grape vines and the chic signs for charming tasting rooms. In Picton, having finally divested yourself of your luggage and automotive responsibilities, it’s advisable to do as the locals do: head to the County Canteen for comfort food and the opportunity to forego the requisite county wine for a pint of fabulous county craft beer. If the County Canteen is slightly over lit for a Friday night, it can be excused as the nighttime hub for the Picton community, young and old. The menu rambles, but delivers. The House Ale straddles the line between malt and hop in a way that some people might describe as “sessionable,” but more importantly is just delicious –especially after a marathon city escape. The County Canteen is the kind of small town pub that leaves you scrolling dreamily through MLS listings on your cell phone. You’re dropped off on Benway Road, at Trail Estate, a no-nonsense winery that specializes in small batch wines, most only available on site. Once you’ve tasted your way through Trail Estate, Hinterland Winery is only 500 metres North. As you walk down the road, breathing in the farmy-fresh air and letting the sun and wine mix and mingle in your head, it’s easy to fall in love. Before long there’s Hinterland Winery and the first stop on your personal tour: County Road Brewing. Housed within two beautiful barns on the corner of Benway and Closson roads, Hinterland and County Road are both wonderful examples of the county’s charming dedication to authentic experiences. After sampling some great sparkling wines – always good to practice muscle confusion by switching up varieties when touring all day – you find you’re not the only one sneaking off in search of a pint. As you order your own flight – a Sumac Witbier, a Saison (recommended to you the night before at the pub), an enticing Belgian Dubbel, and a Pale Ale – a tray of oysters and a Smoked Fish Rillette arrive at the table next to you. Your stomach grumbles, and you turn the menu over, knowing what to order. The Sumac Witbier is a new addition to the tap list that pours a light yellow and tastes of cloves and Belgium. This is the perfect wine-to-beer transition, a pleasant discovery that deserves a toast. Your friends arrive at your table at the same time as the oysters, lucky for them as the taproom is almost entirely full – groups by the door are sharing flights and ordering takeaway bottles. Eccentric and genuine servers buzz around the comfortable, airy taproom that opens on to a patio – nearly full as well – and a splendid view of acres of sun-dappled grape vines. With a bit of spice and a slight hop edge often lacking in this style, the Saison does not disappoint (you remember to thank the bartender at County Canteen for the recommendation on your way back). The Belgian Dubbel pours an attractive dark brown, sweet without being cloying, complete with the expected toffee notes, and a slightly toasted finish. Your flight finishes with County Road 12 Pale Ale (lovingly named after a dirt road to their favourite fishing spot), a well-balanced beer with citrusy, pine notes up front mellowing into a satisfying bitterness. At 32 IBU, County Road 12 Pale Ale is the perfect embodiment of what you should expect from a county craft beer: equal attention to both the malt and hop characters of every brew. Flight completed, you amble over to the bottle shop before heading out to the next few wineries in the area (The Grange, Broken Stone, Closson Chase, and The Old Third). 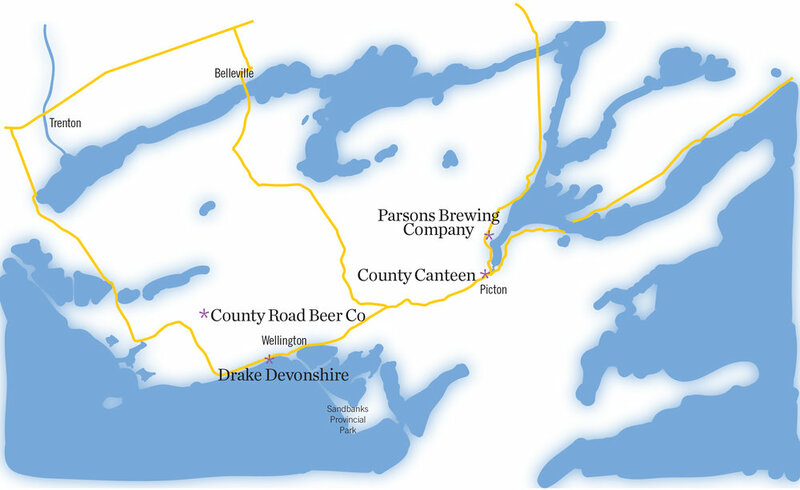 Next, it’s time to rally the troops and head to Parsons Brewing Company, on County Road 49, in Picton. Everyone at Parsons wears their mission statement on their sleeve. Committed to local production and sustainability, the brewery and pub are housed in a charming building cobbled together from half of an old parsonage-turned-blacksmith’s shop (hence the name) and an old county homestead. With an impressive number of beers for such a new outfit (including three stouts, each with its own barrel aged counterpart), and a blend of Mexican and Southern Comfort foods, Parsons is the fashionable place for late lunch, and a necessary punctuation for any overworked wine tour. Farmer’s Tan Harvest Ale is Parsons’ flagship. Pouring a dark amber and with a heavy malt backbone, Farmer’s Tan has just enough hop bitterness (thanks to fresh whole cone hops) to quench the thirst brought on by gargling one too many pinot noirs. Westy Pale Ale – lovingly named after the brewery’s Volkswagen Westfalia delivery van – is generously hopped, and perfectly refreshing – a solid choice for lunch outside on Parsons’ expansive property, soon to be covered in grape vines and hop fields. If anyone in your party needs rousing, suggest they try Grandpa Miguel’s Coffee Stout. Brewed with beans flown in from co-owner Samantha’s father’s coffee farm on the volcanic coastline of Lake Atitlan in Guatemala and roasted locally at County Roasters, it has the right balance of roasted malt and roasted beans to satisfy stout lovers and caffeine addicts alike. Delicately hopped, like so many of the Craft Beers in the County, at the end of the rigorous day you’ll be grateful for the bottle or two you added to the growing collection in the trunk of your taxi. Sunday, 10:30am, Wellington, Prince Edward County. Perched on the edge of the lake in Wellington, the Drake Devonshire’s dining room is an ironic late-night Las Vegas wedding of country kitsch and Toronto hipster sentimentality. From the olive green leather banquette seats and bright yellow camping lanterns to the vaulted ceiling and knit-wool-clad steel beams, what’s most impressive is not the pop-art aesthetic or the astounding view, but the fact that the whole place has managed to exist without too much arrogance or pretension. The staff members at the Drake Devonshire are cut from the same approachable and lovely cloth that you’ve come to expect from the county. The unfortunate twist to this story is that there’s no beer to be had at the Drake. You could order a nice mind-clearing mimosa – once the clock strikes eleven, of course – and, if you did, you might remark on its beautiful colour (how it seems to be only paying lip-service to orange juice, while remembering it comes from more hearty wine stock), or how it erases all damaging memory of the last white wine of Saturday night. But this isn’t the venue for such musings, and so, instead, you order some food: the smoked brisket hash and the fried chicken and waffles, two items that would feel at home at any Toronto line-out-the-door-until-3pm brunch place. The food, delicious and ambitious, without being overstated, pairs nicely with a dash of Pinch Hot Sauce, an upstart Canadian brand currently only served at both Drake locations. The view of the lake combined with a full stomach leads you to search the real estate listings one more time before you get up from the table. The hard reality of the Drake Devonshire hits when the bill comes with the realization that your trip to Prince Edward County was really just a dalliance, a stepping-out on your busy day-to-day life, and that it’s time to pay more than one piper. It’s not worth dwelling on the sheer agony of hitting Oshawa again, total gridlock, stuck seemingly with the same poor souls you raced out of the city not 50 hours ago. Instead, sustain yourself with the promise of all those delicious craft beers secreted away in the trunk of your rental car. From bold, flirtatious Saison, to assertive and confident IPA, smooth and strong Belgian Dubbel, and crisp roasted Stout, the County will always be a mere 3.5 hours away (in the worst of traffic), as will its ever-expanding craft beer scene.